What story do they need to hear? Who should they hear it from? Taking on LGBT rights in Eastern Europe, the Balkans and the Middle East is one of the toughest social and human rights issues one could engage in. Like women’s rights, gay and lesbian rights is low on the list of driving priorities, especially for those in power, who use this power to discriminate. Discrimination based on gender, sexual orientation, or even simply being an immigrant, is a big problem today, all across Eastern and Western Europe. The anti-gay rhetoric used by Russia in particular, to instill fear and hatred among citizens whose countries are working toward European Union association, must be countered. Speak from community values. Issues divide, values unite. Politics is about morality. Check out the portal Da Se Zna, with the purpose to keep track of reported and resolved cases against LGBTQI people in one place and to direct victims to the authorities responsible to react in a legally prescribed way. Leading LGBTQ organizations of Serbia launched this creative initiative. Gay in Macedonia photo essay written about in the Economist. Check out the feature here. The Sochi Olympics were an opportunity to highlight the oppression of gay and lesbian people in Russia, here is one example of the hundreds of stories featured in mainstream media. The US-based Freedom to Marry campaign´s video series with stories from straight allies. Powerful example political ads from campaigns in Minnesota and Wisconsin. 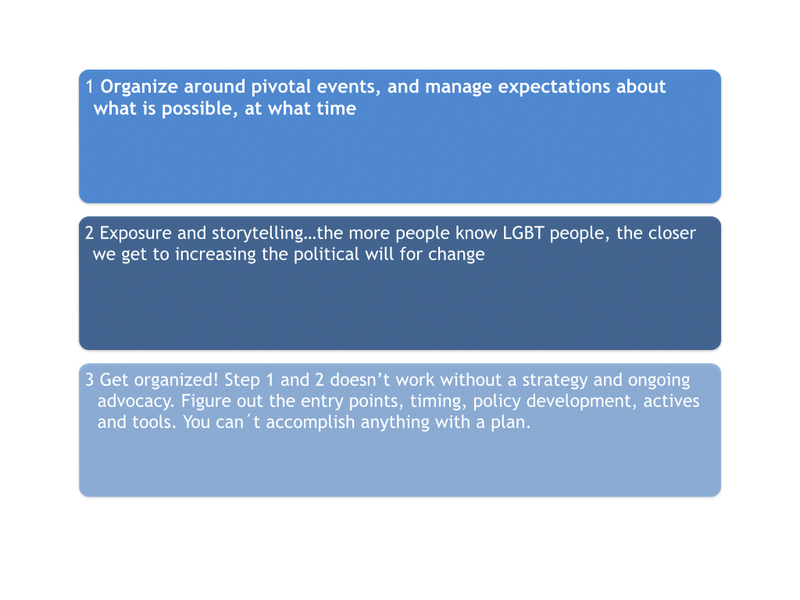 A description of how LGBT activists in Albania tell their story at various gatherings to share their experience more widely and breakdown stereotypes. The result is, that overtime, public opinion shifts, hearts soften, minds expand, paving the way for laws that can follow. In the US, more people today have gay or lesbian acquaintances, which is associated with acceptance of being gay and linked to support for rights and equality. The link between these experiences and attitudes about LGBTQI issues, specifically marriage, is strong, according to Pew Research. I was asked to give a talk on this subject for LGBT activists in Serbia recently. For more, download my presentation: LGBT Rights and Public Opinion, US. In essence, my advice about how to create a world where LGBT rights are respected, flows into three basic steps.